Last night I attended a community forum for educators put on by the Washington Dream Coalition. It was a comprehensive overview of DACA (Deferred Action for Childhood Arrivals), some best practices for working with undocumented students and families, and a ton of great resources. As educators and those working with students, it’s important to stay knowledgeable and up-to-date on resources and services so that we can best meet changing needs. The following are information and resources to help the libraries, broadly and individually, navigate changing policies. The federal administration announced September 5 that the government is officially ending the DACA program effective March 5, 2018. DACA grants temporary protections from deportation to undocumented immigrants who came to the US before the age of 16. Students currently enrolled in DACA may be eligible for renewal, but this renewal must be received by DHS by October 5, 2017. There are many clinics and free-of-charge services to help students navigate the documentation and hefty fees, which can be found on the links provided in this post. UW President Ana Mari Cauce has given strong vocal support to keeping undocumented students safe at UW. 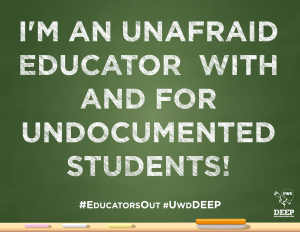 As the libraries, we can do our part to stay knowledgeable about policies affecting undocumented students, and responding/acknowledging vocally with these available resources. This is particularly important considering most undocumented students will not disclose their documentation status. This means we must respond broadly and not just at a point of need. The UW Libraries has an Immigration Guide with updated information on resources and policies (if you have suggestions or additions to this guide, please let me know!). Please let your student and faculty know this guide exists. If you are involved in any student orientations, you can acknowledge the changing DACA regulations by reminding students of the renewal date and this guide. DACA students should have already been contacted by the university, but acknowledging policy changes that are affecting students heavily is a huge impact on student safety and support. The most important local resource on the UW Seattle campus is Leadership Without Borders. For all the necessary information about DACA dates and eligibilities, you can refer to the Northwest Immigrant Rights Project and United We Dream. Both provide FAQs and overviews of dates and situational eligibilities. For a comprehensive history of DACA with best practices for educators, refer to the Washington Dream Coalition Resource Guide for Educators. This guide has further ideas on programs and support services that can be created in support of undocumented students and patrons. Improve your own understanding of immigrant students and services (by reading these materials!). Recognize the trauma of migration: discrimination, isolation, fear, challenges to finding work and accessing resources, and adjustment. Never ask patrons of their immigration status! Offer culturally, linguistically and policy-current programming. Advocate as educators– be knowledgeable about services and resources, and share them widely! Register for an UndocuAlly Training through Leadership Without Borders! These are generally held quarterly and are day long trainings and conversations around the experiences of undocumented students at UW.